Detour Ahead for National Trust’s Main Street Program? 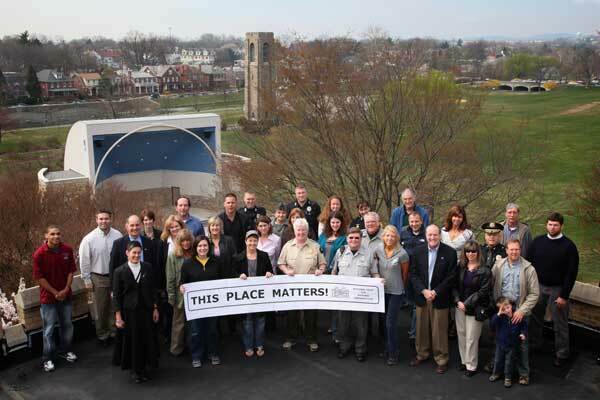 Preservationists in Frederick, Maryland, which received a Great American Main Street Award in 2011. As most of you are aware, since the launch of the Preservation10X framework last September, we have been engaged in a focused and inclusive process to assess the current status of the National Trust Main Street program and the Main Street Center, in order to arrive at the best path forward for Main Street. Thank you for the excellent input many of you have provided during this process. Main Street is one of the most valued programs of the National Trust. It has achieved unprecedented stature nationwide as a highly successful preservation-based economic development program and enjoys great popularity among a wide constituent base. In many ways it has far surpassed what anyone thought would be the outcome of a small pilot program in the Midwest some 30 years ago. Because Main Street has now achieved mainstream success—and because Main Street needs to evolve in order to remain a leading, cutting-edge model for community revitalization—the National Trust has realized that we must envision a new platform that will allow Main Street to flourish far into the future. Last Saturday the National Trust Board of Trustees approved a recommendation to transition the National Trust Main Street Center to a new nonprofit subsidiary of the Trust, which will happen in 2013. We believe we are at the point where new growth and direction for the Main Street Center and the Main Street movement will be best accomplished under a subsidiary board focused solely on growing and enriching Main Street. We are excited that we can continue to support Main Street at the National Trust, while providing the program with the space and focus it needs to reach new levels of effectiveness. Andrea Dono, program manager for research and training, who is a passionate Main Street revitalization expert, writer, and manager of special projects, including Main Street’s social media outreach. We will plan an opportunity in the next few weeks to say good-bye to Doug, Lauren, and Andrea and let them know how much we appreciate all they have contributed to the success of Main Street at the National Trust. We look forward to offering our strongest support to the staff at the Main Street Center who will continue in important functions critical to the new subsidiary—Linda Glisson in publications; Deb Wise in finance; and Tomás Ramirez in membership. Our four tireless field staff—Todd Barman, Kathy LaPlante, Teresa Lynch, and Norma Ramirez de Miess—will continue to work with us on envisioning a system for more robust and wider-reaching field service delivery under the subsidiary. Mary de la Fe will work with our conference team to ensure the 2013 National Main Streets Conference in New Orleans next April is highly successful. This summer we will begin a wide search for a new position, the CEO of the Main Street subsidiary, and will appreciate your help in finding the right person for this challenging and exciting job. We will keep you informed as this process moves forward. Finally, we express our most sincere appreciation to all who participated in the Main Street assessment process, serving on internal working teams, participating in interviews, and contributing feedback on surveys and in focus groups. We are especially grateful to Debbie Feinberg, consultant with Real Change Strategies, and to Valecia Crisafulli, Vice President of Partnerships, who has agreed to serve as acting director of the National Trust Main Street Center until the new CEO of the subsidiary is hired. Thank you for your support and guidance, and the degree of thoughtfulness that has led to these decisions, which we believe will take Main Street to the next level of effectiveness. I’m a big fan of Main Street having served on a local board in California and witnessing first-hand the improvements it made in my former hometown. Moving a program off to the side isn’t unusual for the National Trust–it already has several for-profit subsidiaries, such as the National Trust Community Investment Corporation and National Trust Insurance Services–but I’m sorry to hear that three people that I greatly respect are leaving the organization (you’ll find all three on LinkedIn in case you want to contact them). Although the details of this Main Street subsidiary are still under development, typically the subsidiary is a separate corporation with its own board and financial responsibilities, yet still controlled by the parent organization. I’m glad the National Trust recognizes that Main Street is “one of the most valued programs of the National Trust” and that it “enjoys great popularity with a wide constituent base,” so I hope it will continue to maintain a close strong relationship with the people who live and work in the 2,000 communities that are already part of Main Street. This entry was posted in Historic preservation and tagged Clark Schoettle, David Brown, Main Street, Mary Means, National Trust for Historic Preservation, Preservation10X, Real Change Strategies, Scott Gerloff, Tom Moriarity, Valecia Crisafulli on June 26, 2012 by Max van Balgooy. Wow! That is a surprise. I was just at a Main Street training seminar in Illinois two weeks ago that Lauren was at. There were some organizational changes at the top here at the state level, so I wonder if this has been in the works for a while? As much as I enjoy being a part of the organization, serving on the Board, and believe in the mission, if the City, County, and State levels understood better how their cities function there would be no need for such an entity like Main Street. Well, there is no question that the current arrangement isn’t working. The “merging more into the Trust” of the Main Street Center a few years ago (part of which I think had to do with Kennedy Smith’s leaving) didn’t benefit, I think, the Main Street Approach more generally. The Main Street Approach needs a significant tune up. Just like the Trust has been unwilling to look inward and reach outward in terms of rethinking its direction, the same goes for Main Street. I am committed to the Approach, helped found two programs, including one that is now considered very successful (it was just featured in the Financial Times last weekend), served as a program manager, and did a couple commercial district revitalization framework plans for small communities in MD and GA. But I think that the Main Street revitalization needs continued updating, testing, and improvement. Sadly, I don’t think that the new structure, given the evaluators role in the problems of the current structure, will necessarily be any better. So the National Trust continues it’s downsizing by restructuring, reorganizing and shuffling off various programs. Perhaps it would best if the Main Street Program was totally separated from the National Trust. Out in the field we await to see what the National Trust will actually be doing to make it a worthwhile investment as a national moral compass for historic preservation in America.